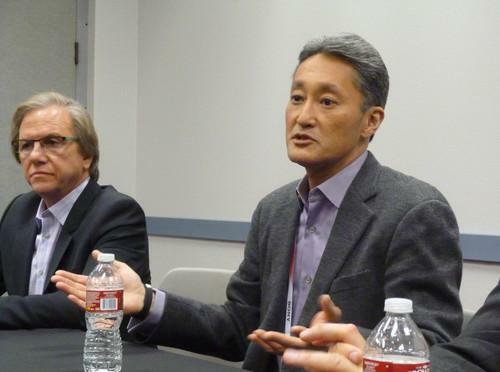 Sony CEO and president Kaz Hirai (right) and Mike Fasulo, president and chief operating officer of Sony Electronics, speak with reporters at CES in Las Vegas on January 7, 2014. Sony's new streaming video service, due to launch in the U.S. later this year, isn't intended as a direct competitor to cable television, CEO Kaz Hirai said Tuesday. The service, which was unveiled earlier in the day during a keynote speech at the International CES expo, will combine live television with a large library of on-demand content and will initially be delivered through Sony networked devices such as PlayStation consoles. "It's trying to bring a new experience of TV viewing that combines live television but makes it seamless so you're also accessing other streamed content as well," Hirai said during a briefing with reporters. "We always talk about it as an industry, but we've never brought it all together, and I think we have the opportunity to do something very unique." Sony didn't divulge many details of the planned service. The installed base of Internet-enabled Sony devices in the U.S. is around 70 million devices, the company said. That includes 25 million PlayStation 3 systems. "Based on the number of users streaming videos on any given day, our network would rank among the top five cable and satellite providers in the U.S., and PlayStation 3 is the number-one device in the world for watching Netflix in the living room," said Andrew House, president and group CEO of Sony Computer Entertainment, during the speech where he introduced the service. Despite that large potential audience, the new service isn't intended to battle against cable TV companies, said Hirai. "We're offering live TV and combining it with other video services," he said. "That's what we want to offer our customers. We don't set out to compete with cable companies." "We want to offer a convenience. Everyone has been talking about it and no one has been able to do it," said Hirai. Sony already offers some recorded content, consisting mainly of movies, to PlayStation owners through its PlayStation Network service. Last year it launched a video delivery service for 4K content that pushes video files to an in-home server.